The evenings stay lighter much longer these days giving hope for the impending spring days ahead of gardening, the return of birds,watching tender herbs popping their heads out from under the earth’s crust newly uncovered of cold snow. The Country Artist is about to get busy. We will need the extra protection, relief and moisture my lines of hand creams, muscle rub will offer you. 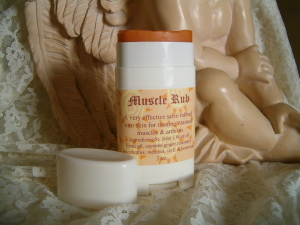 When your body needs some R&R from a day of overuse grab my soothing, warming muscle rub. Infused with capsaicin and menthol, laced with essential oils known for analgesic effect. I am my own best customer after all these years of gardening but its the customers who keep telling me about their love of this formulation. My comfrey salve is one of my oldest formulations that is time tested and reputed as having an amazingly fast rate of soothing and healing of chapped sore hands, cracked heals, and minor abrasions. This product is generations old and stands on its own merits. guaranteed! After the log cold days spent dreaming about our spring and summer it is finally here! Come visit The Country Artist or do a virtual tour here on my website. You are sure to come away with a smile!